THE WORLD’S FIRST self-driving taxis began picking up passengers in Singapore. NuTonomy is starting small — six cars now, growing to a dozen by the end of the year. The ultimate goal, company executives say, is to have a fully self-driving taxi fleet in Singapore by 2018, to help cut the number of cars on Singapore’s congested roads. Eventually, the model could be adopted in cities around the world, nuTonomy hopes. For now, the taxis only run in a 2.5-square-mile (6.5 square kilometer) business and residential district called “one-north,” and pick-ups and drop-offs are limited to specified locations. Riders must have an invitation from nuTonomy to use the service. The company says dozens have signed up for the launch, and it plans to expand that list to thousands of people within a few months. The cars — modified Renault Zoe and Mitsubishi i-MiEV electrics — have a driver in front who is prepared to take back the wheel and a researcher in back who watches the car’s computers. Each car is fitted with six sets of Lidar — a detection system that uses lasers to operate like radar — including one that constantly spins on the roof. There are also two cameras on the dashboard to scan for obstacles and detect changes in traffic lights. The testing time-frame is open-ended, said nuTonomy CEO Karl Iagnemma. Eventually, riders may start paying for the service, and more pick-up and drop-off points will be added. NuTonomy also is working on testing similar taxi services in other Asian cities, the U.S. and Europe, but he wouldn’t say when. “I don’t expect there to be a time where we say, ‘We’ve learned enough,’” Iagnemma said. NuTonomy, a 50-person company with offices in Massachusetts and Singapore, was formed in 2013 by Iagnemma and Emilio Frazzoli, Massachusetts Institute of Technology researchers who were studying robotics and developing autonomous vehicles for the Defense Department. Earlier this year, the company was the first to win approval from Singapore’s government to test self-driving cars in one-north. NuTonomy announced a research partnership with Singapore’s Land Transport Authority earlier this month. Singapore is ideal because it has good weather, great infrastructure and drivers who tend to obey traffic rules, Iagnemma says. As a land-locked island, the city of 5.4 million people is seeking creative ways to grow its economy, so it’s been supportive of autonomous vehicle research. Auto supplier Delphi Corp, which also is working on autonomous vehicle software, was recently selected to test autonomous vehicles on the island and plans to start next year. “We face constraints in land and manpower. We want to take advantage of self-driving technology to overcome such constraints,” said Pang Kin Keong, Singapore’s Permanent Secretary for Transport and the chairman of its committee on autonomous driving. But she quickly relaxed. The ride was smooth and controlled, she said, and she was relieved to see that the car recognised even small obstacles like birds and motorcycles parked in the distance. “I couldn’t see them with my human eye, but the car could, so I knew that I could trust the car,” said Seow, who hopes to use the time freed up during her commute, thanks to the technology, or use the service to help her father get around town as he grows older. An Associated Press reporter taking a ride Wednesday saw the safety driver step on the brakes once, when a car was obstructing the test car’s lane and another vehicle, which had appeared to be parked, suddenly began moving in the oncoming lane. Email “These taxis can drive themselves and are ferrying people about in Singapore”. 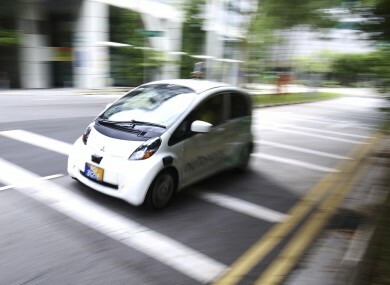 Feedback on “These taxis can drive themselves and are ferrying people about in Singapore”.